The Datepicker Options plugin add a bunch of extra options to date fields in WordPress forms. In your WordPress admin, go to 'Formidable' → 'Add-Ons' and click the 'Install' button for the WordPress Datepicker Options plugin. The Formidable Forms Pro plugin includes the option to set a dynamic year for the start and end year range. But if you would like this range to change when another date field changes, or set a more specific range that starts or ends on a specific date rather than at the beginning or end of the year. Open the field settings for the date field in your form. Check the box to 'Set specific minimum and maximum dates'. The minimum and maximum dates can be set in a number of ways. Select 'Current date' and insert -18 years for the maximum date to only allow someone who is over 18 to submit the form. When using two date fields, set the second field to start 2 days after the date selected in the first field. In the second field, select the name of the first date field from the dropdown and insert +2 days in the box. Uncheck the 'All days' box for 'Days of the week'. Now you'll see a list of each day of the week. Uncheck the boxes for any days of the week you do not want to allow. 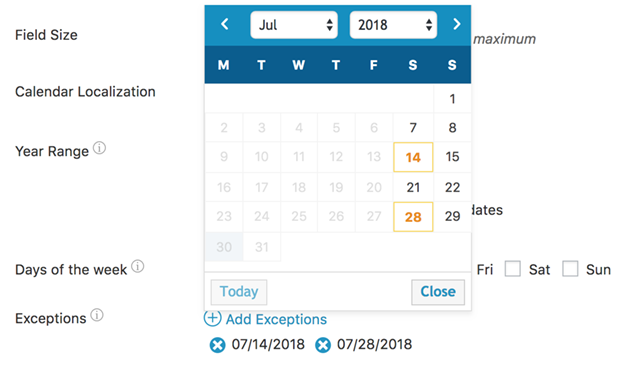 When a day of the week is disabled, but there is a date you would still like to be selected, you'll need to add an exception. For example, if you blockout Saturdays but there are two Saturdays you would like to allow, add exceptions. After blacking out a day of the week, the 'Exceptions' link will appear. Click this link and select the dates that should be selectable in your datepicker. 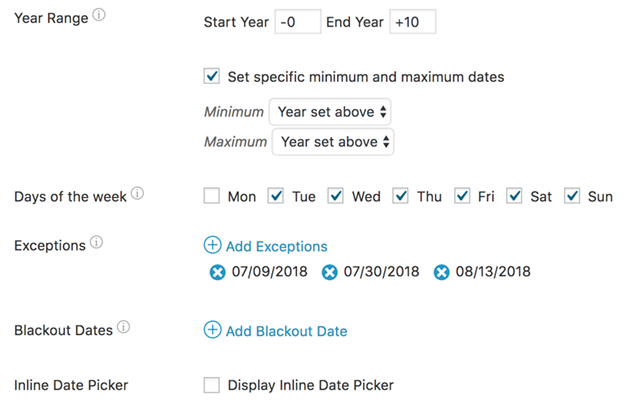 When there are specific dates (like a holiday) that should be excluded, use the 'Blackout Dates' option. Click the 'Blackout Dates' link and a datepicker will appear. Select each date that should be blacked out in your form. 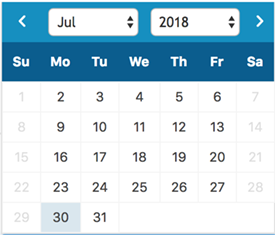 When the datepicker is set to show inline, it will appear on the form instead of a text field to click. To show the datepicker directly in the form, check the box to 'Display Inline Date Picker' in the field settings.